Commentary: Worth it. 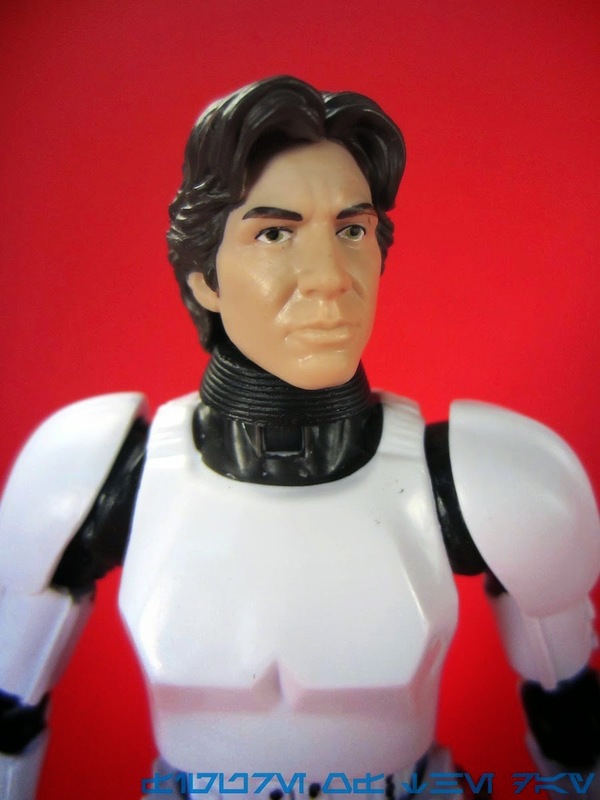 Han SOlo (Stormtrooper Disguise) gives you more or less what you expect in a tooling-saving figure. So far Hasbro hasn't done much in the way of repaints outside of Clones and Stormtroopers (and yes Sandtroopers) so they have to make up the difference somewhere. 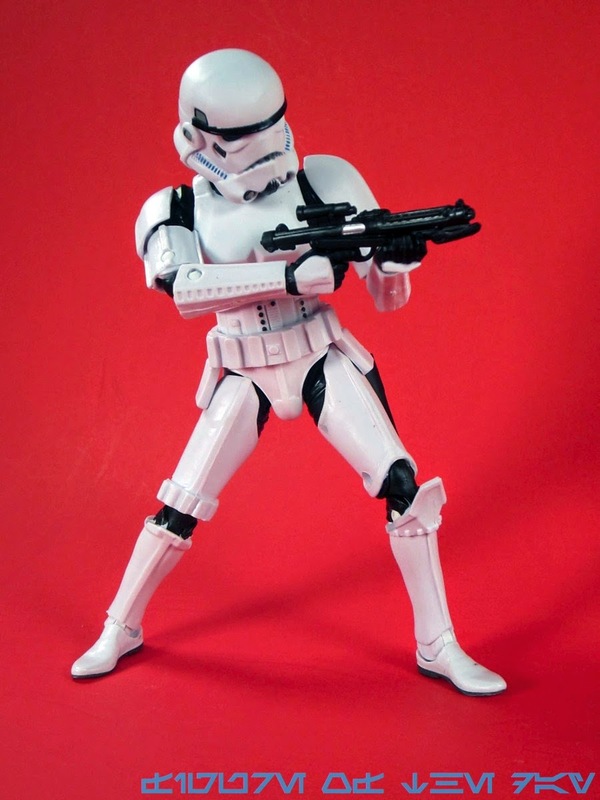 This release is indeed the 2013 Stormtrooper body right down to the original copyrights, but with a couple of deco tweaks. This means Han is a little short for a Han, but not for a Stormtrooper. Standing a fraction of an inch under his vested counterpart, this version has slightly lighter head and slightly paler skin. The eyes seem more correct in terms of color, as they are no longer blue. The head more or less works with the body, but it also feels a little small without the helmet - which is probably how it should look. 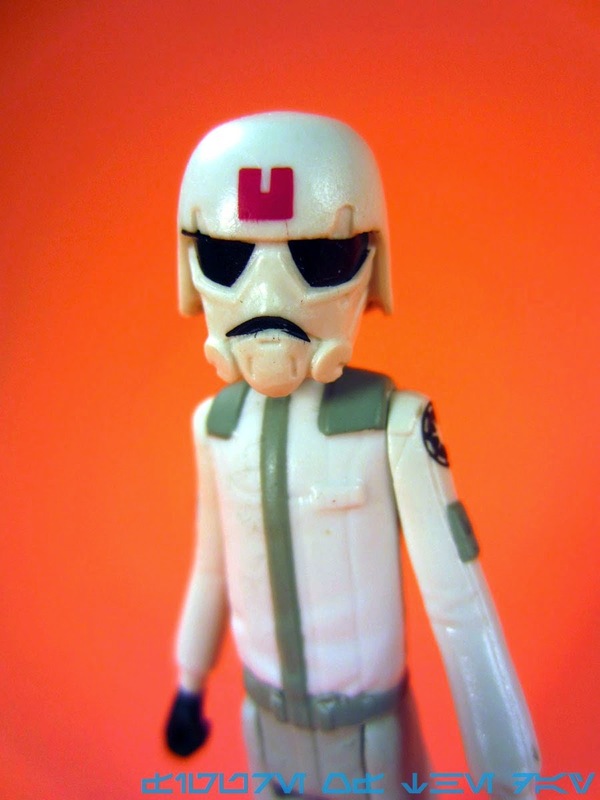 The neck peg is longer than the Stormtrooper's, and there's a collar around his neck that covers some of the joint and adds that ribbed look we've gotten used to since the 1995 Froot Loops mail-away. The most significant deco change is a dash of silver to the side of his blaster, as you won't find that on the other releases so far. 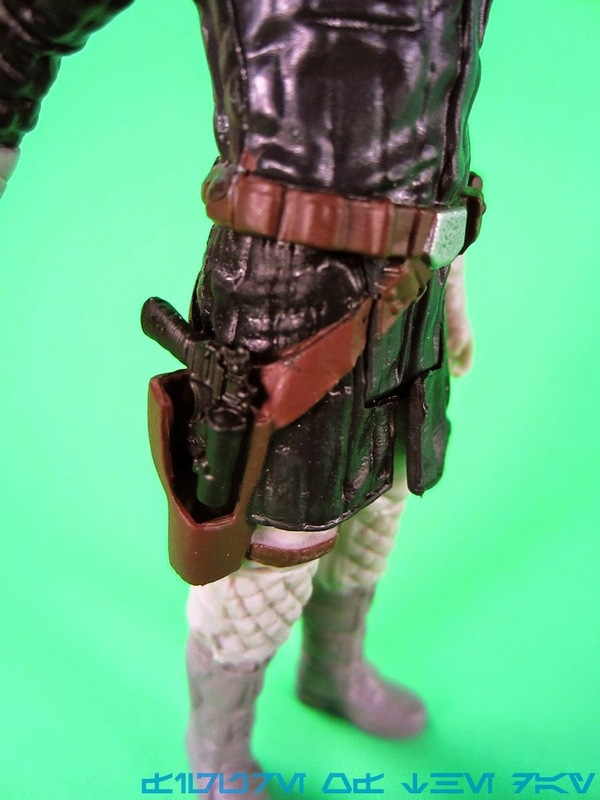 With a working holster (yay) and no long rifle or manacles for Chewie (boo) this is a figure that ticks off all the requirements for the least amount of work to make this figure. Well, that's not fair - we got a new collar piece, which is easily popped off (don't lose it) and is probably the same piece we'll see on Luke in the next month or two. 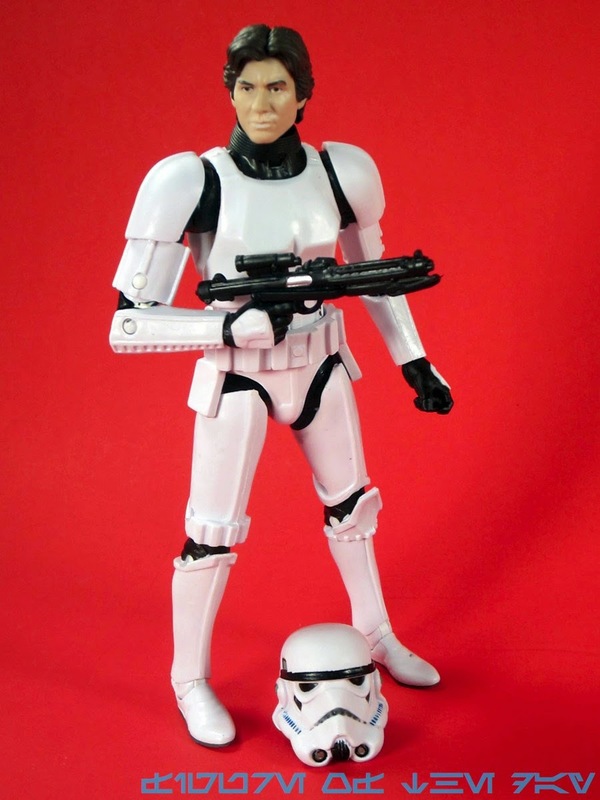 I dig this figure because it's a solid Stormtrooper with slightly different helmet paint, and really, we can all use another Stormtrooper or two. My figure was mostly clean and free of slop, but more on that below. It's good enough to get, and if it goes on clearance somewhere I will buy many of them. Collector's Notes: I got this from Entertainment Earth. I have not seen any in stores yet. Cleaning Notes: Before I opened the box, I noticed that there was some black paint splattered on the helmet with a straight line going from the "mouth" to the "chin." Oh no! Thankfully there's a cheap way to remove it - the magical Mr. Clean Magic Eraser. I've used these to clean up a lot of old soft plastic figures like Battle Beasts and Remco's vinyl Extraterrestrial figures, and about 45 seconds of scrubbing took it right off. It's great for removing dirt - and paint - from various toys. 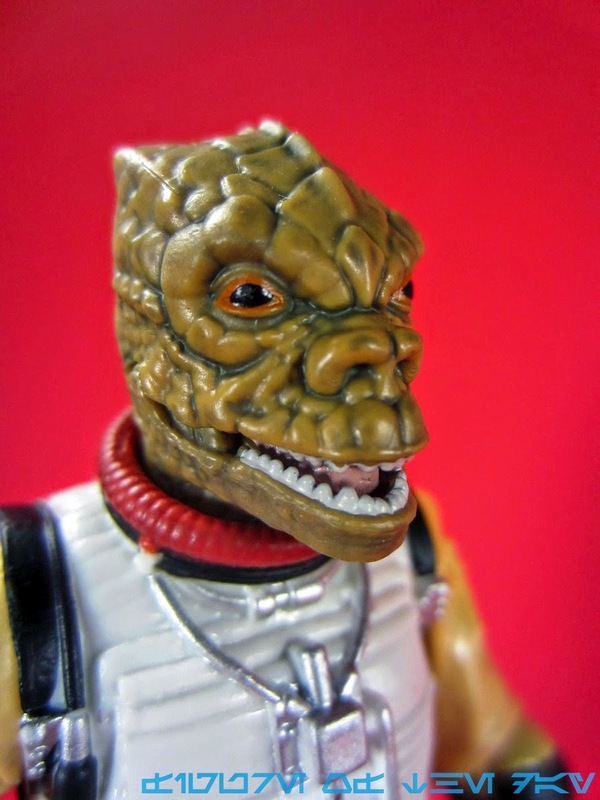 Commentary: You will not be disappointed by Bossk and I do not believe you will be pleasantly surprised, either. This figure has a special feature that really sets it apart from his peers with the first-ever articulated jaw! My sample may be dislocated, as it moves but it feels like it was assembled strangely - the it takes some doing to shut it. But other than that, this figure is everything that his Mission Series counterpart isn't. At a hair under 6 1/2-inches tall, he's a big enough figure with loads of articulation and paint, plus separately sculpted straps. They did a nice job here. While light on deco, his gun deserves special notice. You may notice that the gun has a brown strap with silver bands around it, but what's really stunning is that the strap is a separate piece. You can actually remove the strap if you really want to - I don't, but as design elements go this is an extremely impressive level of detail for a Hasbro product. The ability to pose the strap is something I've never seen on any of my figures of this size before, so just let me say I am easily impressed. Finding good reference on the patches on his shoulders is tough, but it looks like most shots would indicate this one is off a bit. The blue is a little thick, the red was left off, and compared with the Unleashed figure in roughly the same size the detail seems a bit off. At this scale it's easier to see the colors are a little too faded and the blue design in the corner isn't quite right, but odds are you won't notice this too much. Hopefully they'll tweak this detail on a future release. These kinds of things are easier to gloss over on smaller figures thanks to the amount of detail you can get in there, but starting around this size you really start to notice. His head is great, as is the rest of the figure. You get all the scaly detail you would hope for, plus a bit of a wash to bring them out. His wrinkled flight suit is nice and yellow, with a few painted bits and pieces under the grey plastic straps. All of his claws are painted, so in many respects this is like a slightly better upsized Vintage figure. Depending on how you feel like counting, his 23 points of articulation are stupendous and the double-jointed knees are always a nice touch. 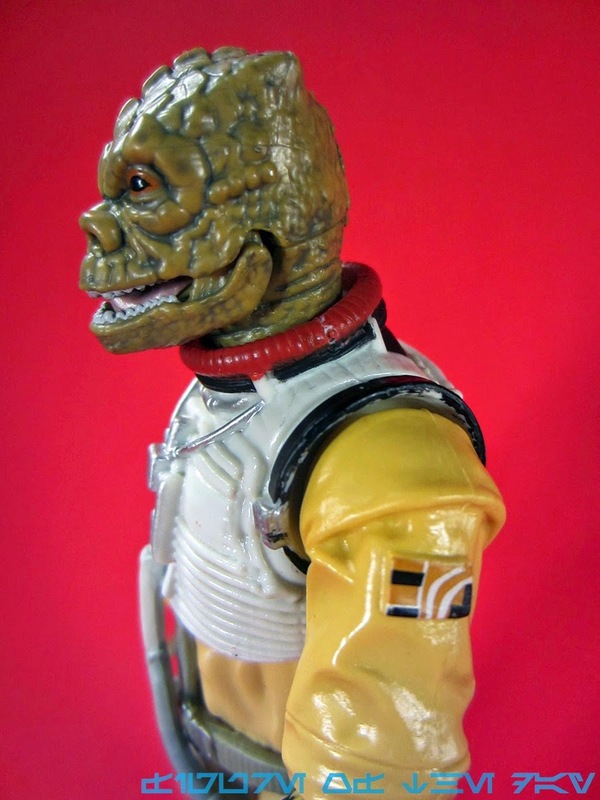 The elbow articulation is no better than what we had in his smaller counterparts, but the bend-and-swivel wrists are nice and the straight, arguably useless right hand is a nod to similar manual appendages on the many other Bossk toys from over the years. The ability to get both hands on his gun changes his personality when you pose him, plus the fact that he's taller than Boba Fett (but just a hair shorter than Darth Vader) makes him a good addition to your toy shelf. For $20 you're a putz to not buy it. 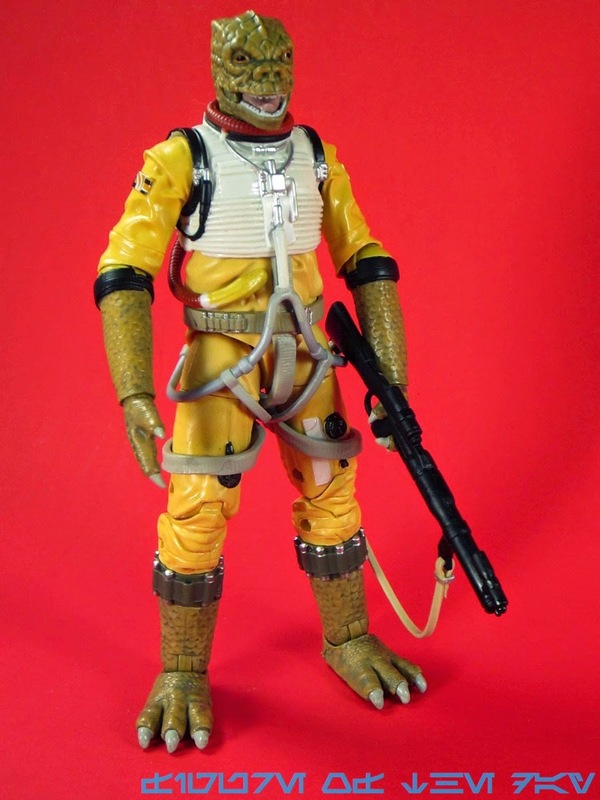 With $50+ Figmas and similar figures from Mattel at or around $30, Bossk is the kind of figure you would probably want to get unless you hate Bossk. If you're trying to keep your 6-inch collection light, this figure does a very good job of getting the job done - for that reason, he's interesting. 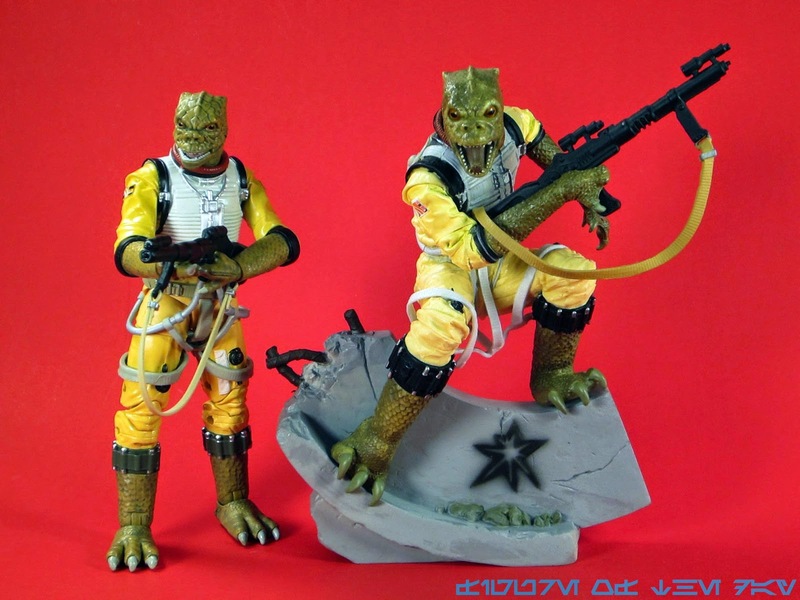 On the other hand, Unleashed Bossk is a tad larger and the same price - but isn't articulated. I'd suggest examining both and grab the one that fits your needs the best, whatever they may be. I assume for most of you, though, articulation trumps pretty much everything else and the opening jaw, while a bit stiff, is a hard feature to resist. 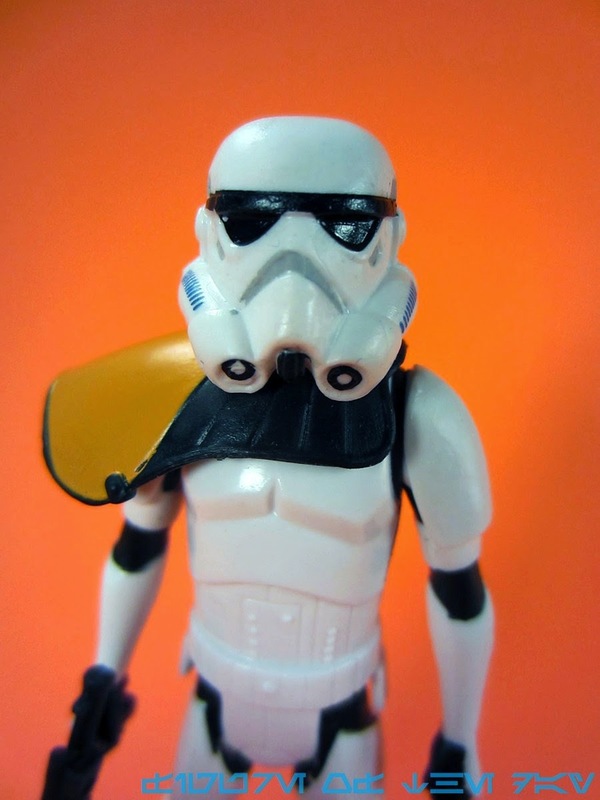 Commentary: The funny thing about this Stormtrooper Commander is that it's basically just a Stormtrooper with an orange shoulder pad, which puts it in line with how the fandom generally saw Sandtroopers in the early 1990s. 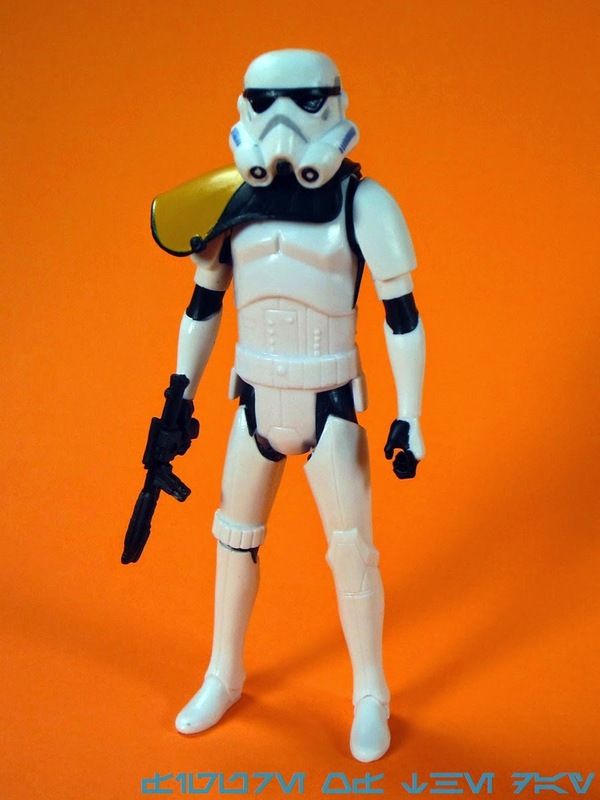 A lot of the customs in the early Internet and pre-Internet days didn't feature things like backpacks or dirt - you just got a Stormtrooper, you added a shoulder pad to it, and you called it a day. The notions of variant lenses in the helmets and the diamond-shaped knee armor never even came up in most discussions I've had and certainly never showed up on customized figures. For that reason, this is sort of a perfect fit for that whole nostalgia bomb that is most of Rebels. 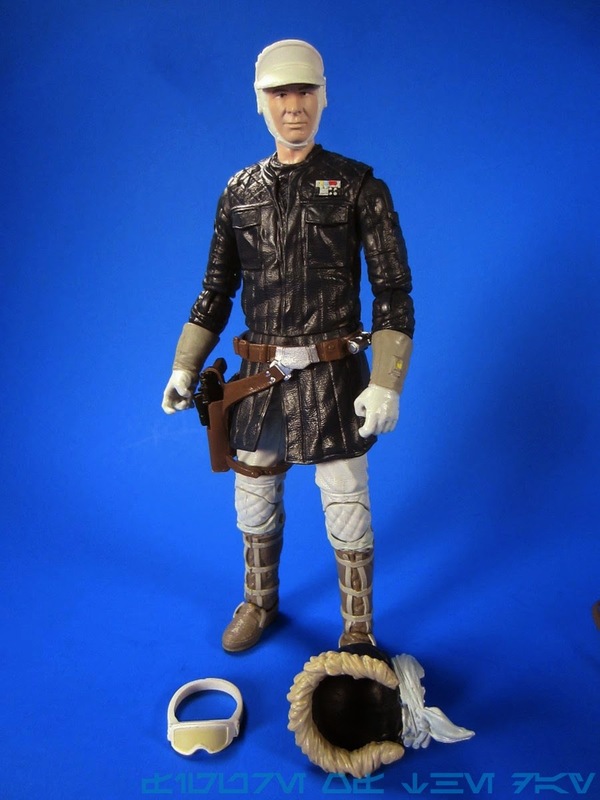 This figure really feels like it might have been a Kenner design for a Sandtrooper in the 1980s, had the line continued - if Walrus Man can have swim fins and no jacket, a Sandtrooper can be a Stormtrooper with one new part. That's just good science. The figure is part of an unusual directive in this line, in that Hasbro is actually making a lot of Stormtroopers. 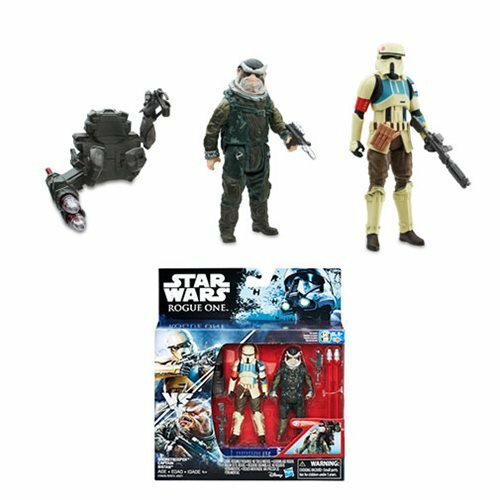 This rarely happens - usually they're made at a rate similar to the other figures, but this time around you can get a plain white Stormtrooper as a basic figure or in at least two different Mission Series packs, plus this one. They all have the same basic sculpt with rotating necks, shoulders, and hips. He has no problems fitting in any of the vehicles or handling his blaster rifle, which is the same one you'll see with the other Stormtroopers in this line. The detailing is pretty good, and on par for action figures of this era. The armor in the cartoons has this wonderfully shiny white metallic look that seems impossible to replicate on a toy of this price point, but perhaps someone will let Funko's Hikari factory take a crack at it in the future and come up with something superb. For the money, this is a set that's worth picking up because you get one new figure and one new enough figure for ten bucks. And if you hate the pauldron, you can clip it off and get another plain Stormtrooper. You've got options. Collector's Notes: I got this from Entertainment Earth. This set started appearing in stores late in March. You may find it in a store today. 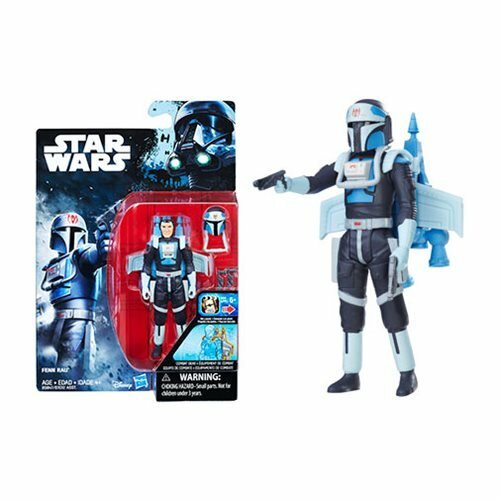 Commentary: While the Kanan in this set is one of no less than four ways to buy pretty much the same exact figure, Ezra Bridger is new. And not just a little new - a lot new. The figure is almost a half of a head shorter than the previous release for reasons I do not understand, making this a bit of a surprise. 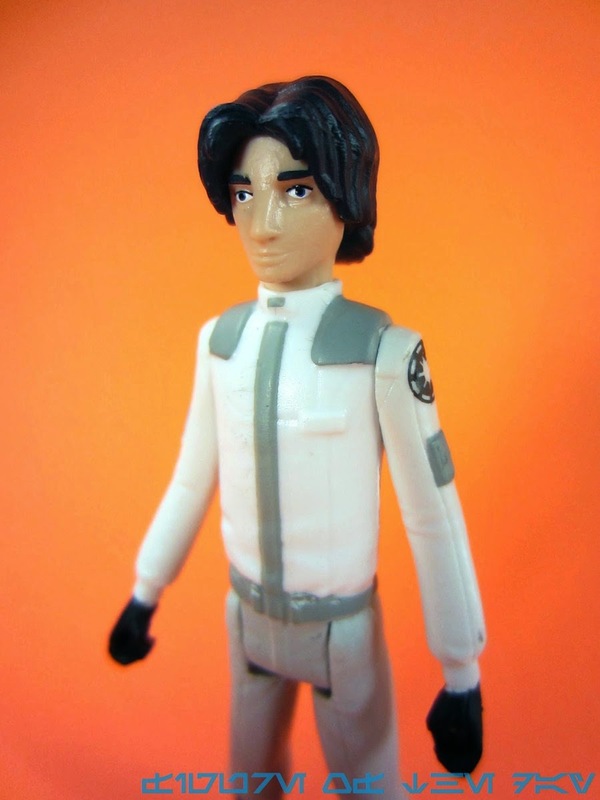 The outfit was worn by several academy students in the cartoon, including several who never took off their helmets - making this an ideal body to use and reuse for several new figures, provided Hasbro elects to make new heads. 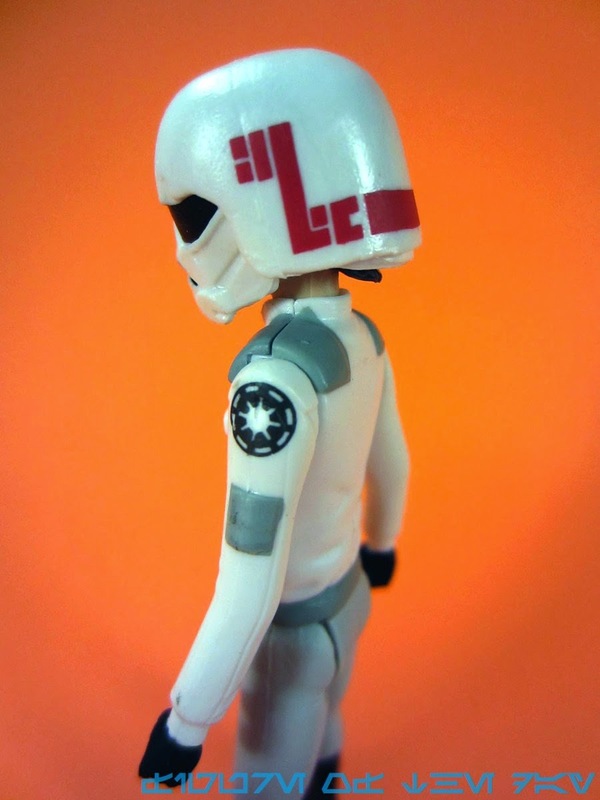 The helmet is similar to the last one, but is cast in a whiter plastic with new, unique red markings. I have no idea what any of these markings mean - I assume it's just something each cadet adds for fun, but perhaps there's a rank or honor system here. He has no blaster or weapon, but press photos show him carrying Kanan's lightsaber for some reason. The deco is pretty clean on the figure, with boots, gloves, and various jacket details painted in within the lines. I realize this doesn't sound exciting, but I've seen (and bought) a lot of sloppy toys over the years. Seeing rows of figures that all look good is a nice change of pace. If you've been following the new, simplified figures you know what to expect out of this one. He stands fine, sits fine, and doesn't offer a lot new other than being a good representation of something you probably didn't buy yet. If you don't have Kanan, you're basically paying $10 for the first (and so far only) new costume figure for any of the main cast of this show. I don't assume we'll see a lot more given that the line seems to be crawling along slowly, and things like new movies will no doubt quickly distract Hasbro from supporting the TV line. (See: 3-D movie reissues decimating new The Clone Wars product.) I assume you have Kanan by now, as to be "complete" for this line you're going to have to buy at least two of him just to get this Ezra and the holographic Obi-Wan. And should Hasbro make any other gift sets, you'll probably need to get those, too. I'd say get this figure because it's a unique costume, a unique sculpt, and if The Clone Wars is any indication you're going to be really, really sorry if you skip anything from this show in the long run. 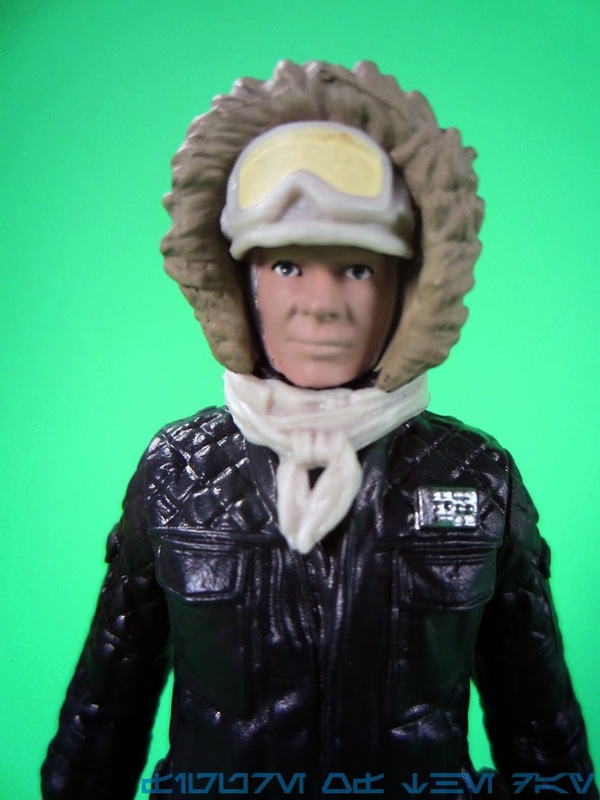 Commentary: I suggest getting this set, because Hoth is awesome and these guys stand up well. But between the two, Luke Skywalker is the lesser figure. 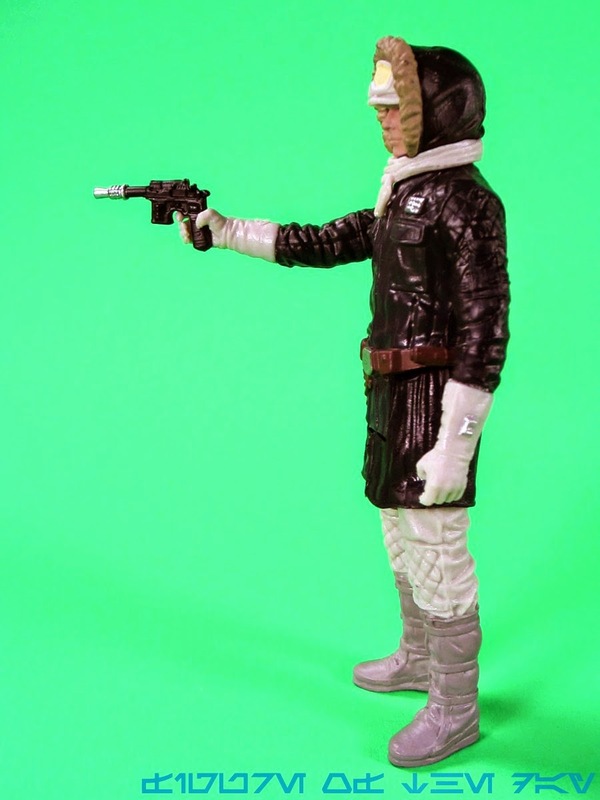 Not only has it been released on the heels of a super-articulated new head/redeco figure from The Black Series, but that original The Vintage Collection Hoth Luke from 2012 was even better with fancier paint apps and less blood. I guess if you get the vintage figure and the Mission Series figure, you can skip The Black Series one - it's really the middle child. The funny thing is there are quite a few differences between this release and the previous ones in terms of deco, and when I'm looking at reference photography you can make a case for it being "correct." 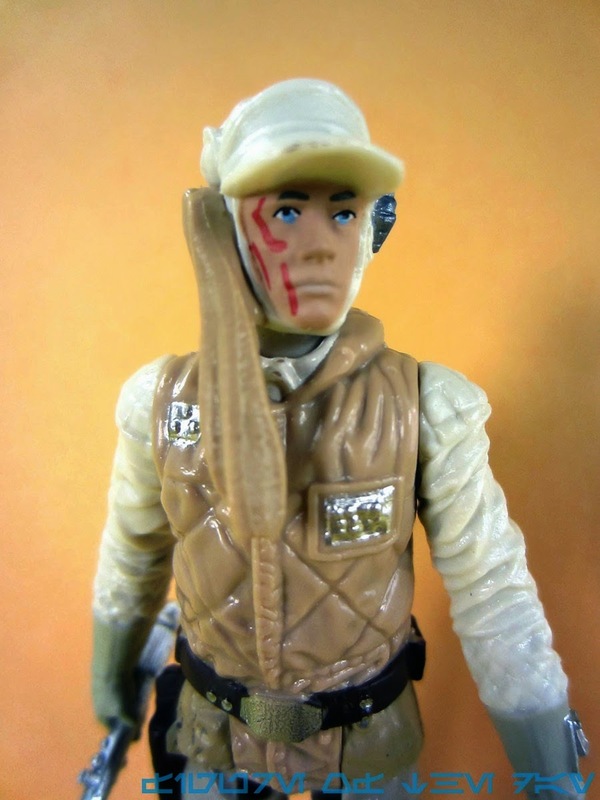 Overall, this figure owes a lot to the original Kenner figure (mostly unpainted arms) and the previous Black Series figure in terms of plastic color. But there are a lot of strange differences, like the fact that the shoulders and boot straps are now unpainted, or that the gloves are now all one color. The funny thing is I see some reference shots of one-color gloves, and others where they're clearly two-tone. Based on some of what I'm seeing, I don't think it's out of the question that there may well be two different sets of gloves and as such, this figure may as well be labeled authentic. The facial scarring is different from the movie stills, with the previous release getting higher marks for having... higher marks. The orientation seems more accurate there, even if this newer figure seems proportioned a little more weakly in the torso zone. Also, the pockets on the sleeves are missing, plus the pants are now brown instead of grey. 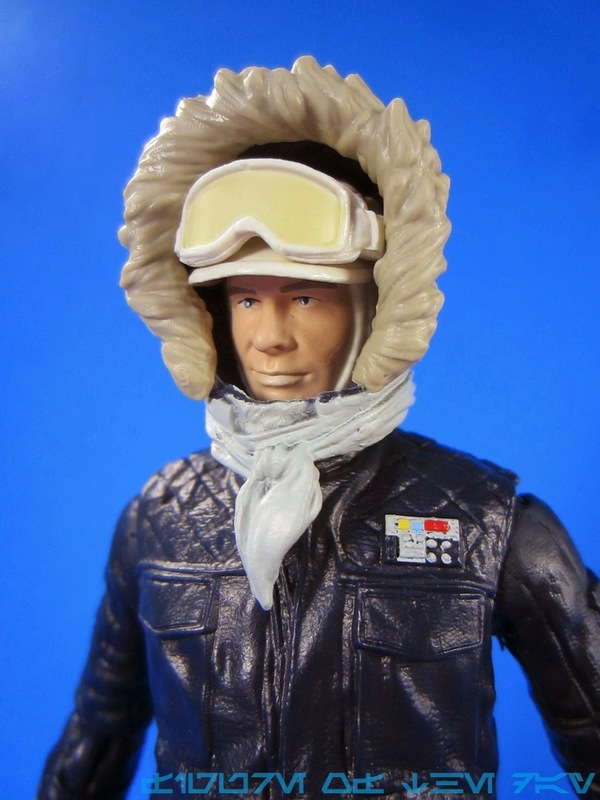 For all I know this might be another reference issue, because there's a costume labeled Luke's Hoth Gear at the National Air and Space Museum that, from the photos, could be the source of some of the differences. The figure is about as good as Han in terms of engineering. He can't quite sit, he makes you wish you had a trapdoor Tauntaun with a modern sculpt, and he has no problems holding the lightsaber. Some of the minor paint apps are gone, as are some of the pouches on his belt. The bottom of his parka is also a little more tattered. What we have here is an unquestionably different figure, and determining the design reference should be a fun thing to do when I have time to sit down and do it. Which will be never. So for now, I like this figure because it looks different enough from the last two to really qualify as being different, and at this point "different" is arguably the most I can hope for. Get this set if you see it, it's worth the ten bucks. Collector's Notes: I got this from Entertainment Earth. This set started appearing in stores late in March. Commentary: Get this set. 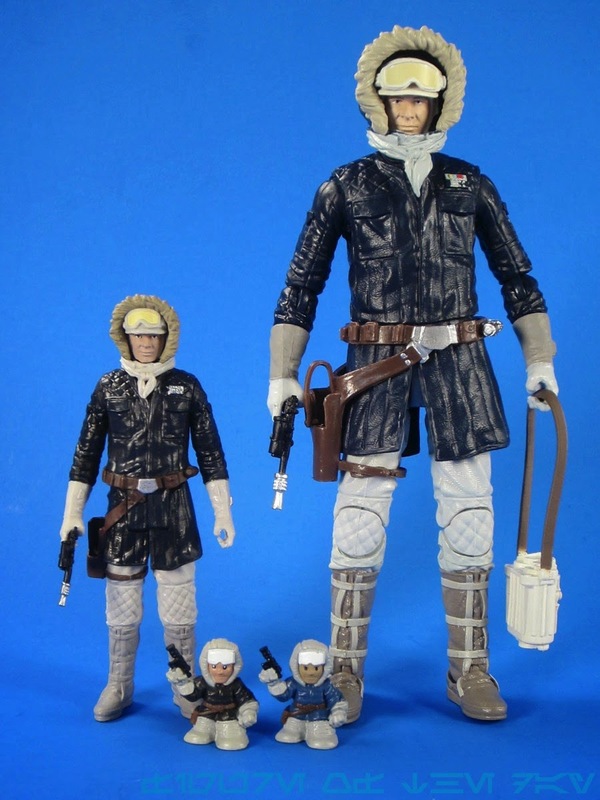 I can't imagine whey they didn't single-card these two, as Hoth Han Solo is pretty fantastic. In terms of sculpt and deco, it's very similar to the 6-inch figure we just looked at last week - it just lacks a few key details, a little silver and some markings on the gloves. Oh, and there's only five joints and no removable parts, but other than that? Basically the same look and feel. For you old farts, this figure is the real deal. 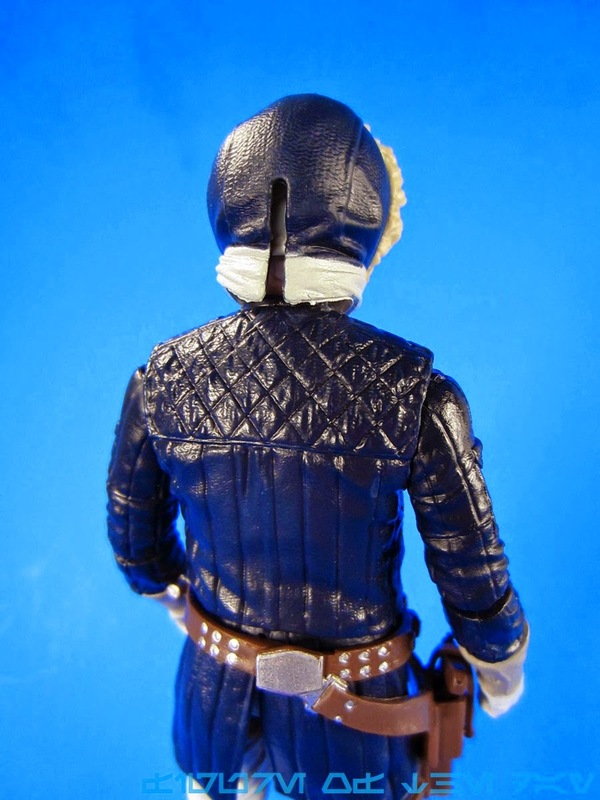 The jacket is more of a brownish color, but the sculpt is pure 1980. 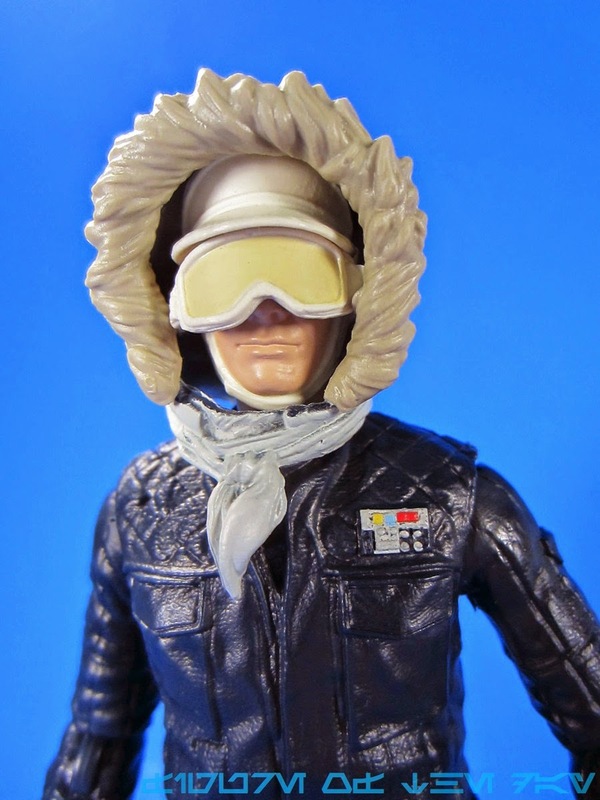 Han's goggles are on his head, his arms are straight, and he looks like he needs a new Tauntaun with a trap door. This is exactly what I pictured the future of Star Wars figures to be in the early 1990s. And you might be saying "Adam, you really thought that the action figures of the future would have slightly better paint and significantly better sculpting?" Well, pretty much yeah. 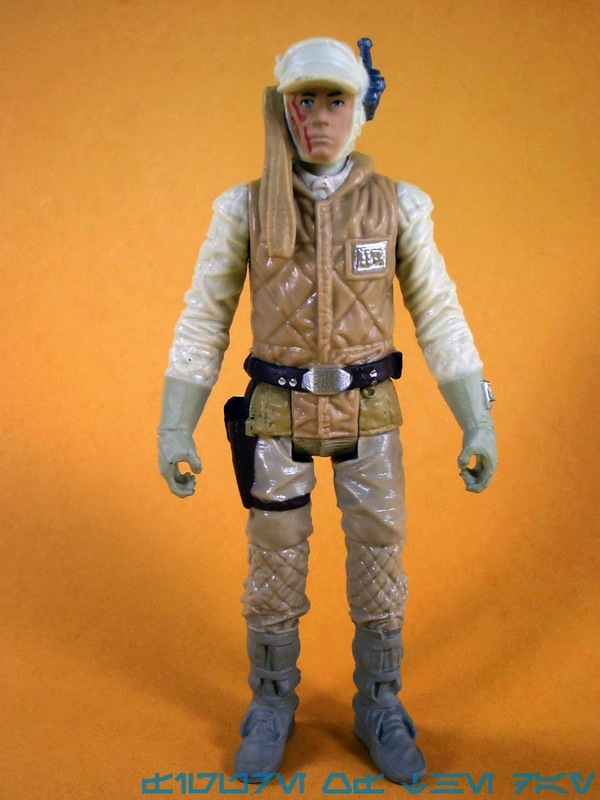 I was originally expecting Star Trek-style 4 1/2-inch figures for five bucks, but clearly Kenner didn't want to go that route - so when I heard 3 3/4-inch, this is more or less what I figure we'd get. 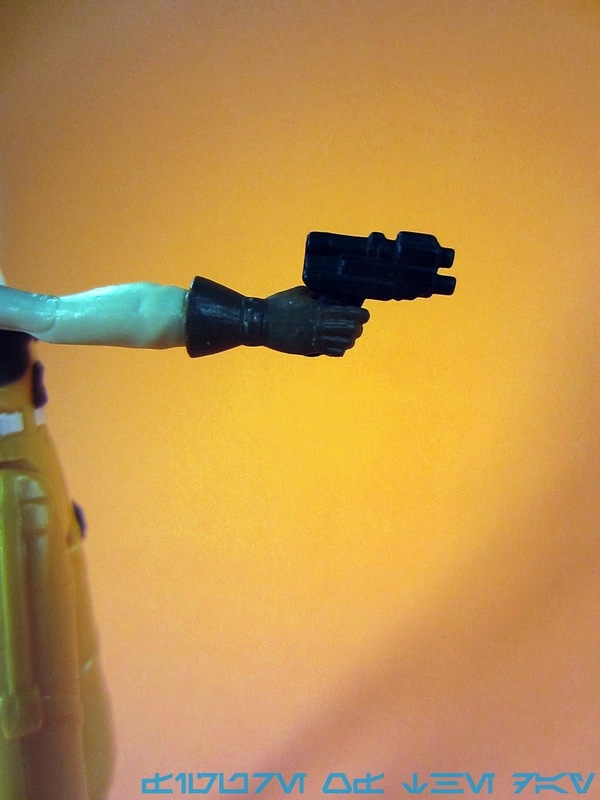 The figure holds his gun just fine, and he can hold Luke's lightsaber. The silver barrel on his gun is a real surprise, but the lack of painted straps on his boots is not. 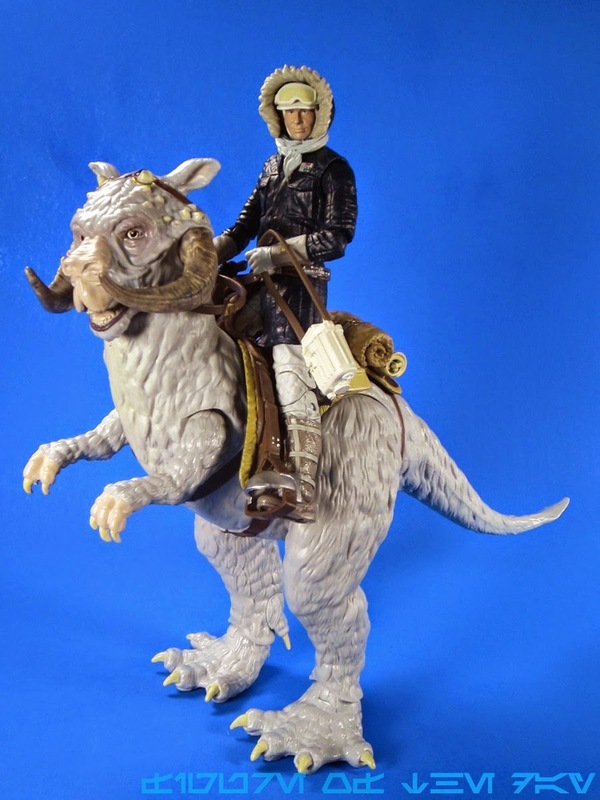 His leg joints are a little weak - he can't sit in most vehicles due to the range of movement, and he can't fit in any modern-era Tauntaun thanks to the lack of trapdoors or lateral hip movement. 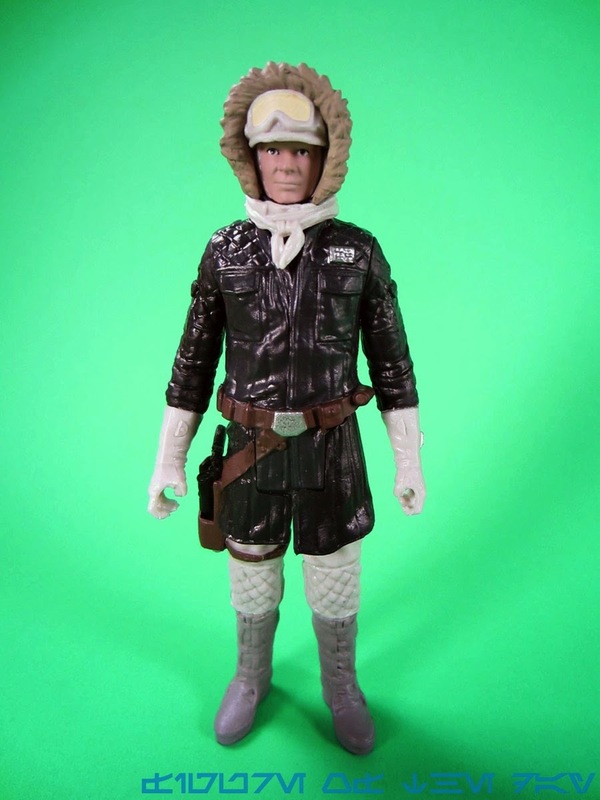 I need to unpack my 1980 Tauntaun to check the legs, which I have not been able to find the time to do just yet. 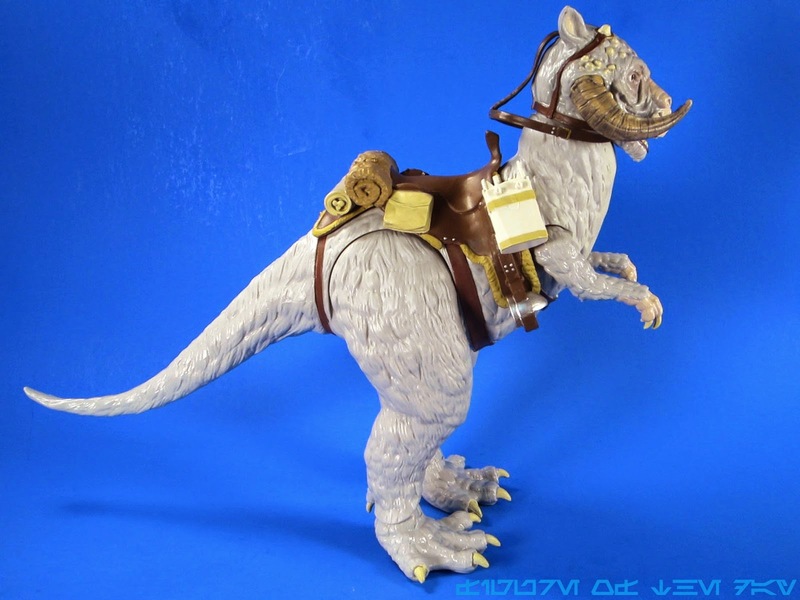 I really hope Hasbro keeps going down this road of quasi-Kenner remakes and goes whole hog to give us a $15-$20 simplified Tauntaun, but given that the 6-inch one is $40 and has a great 6-inch Han figure maybe we don't need them to do that. This is a great little set for the money, and given the similarity between the big and small figures that just hit I can't necessarily say you need both. I need both - each one does different things for me. But on a shelf, side by side, the similarities are oddly striking. Commentary: It's a proud tradition. 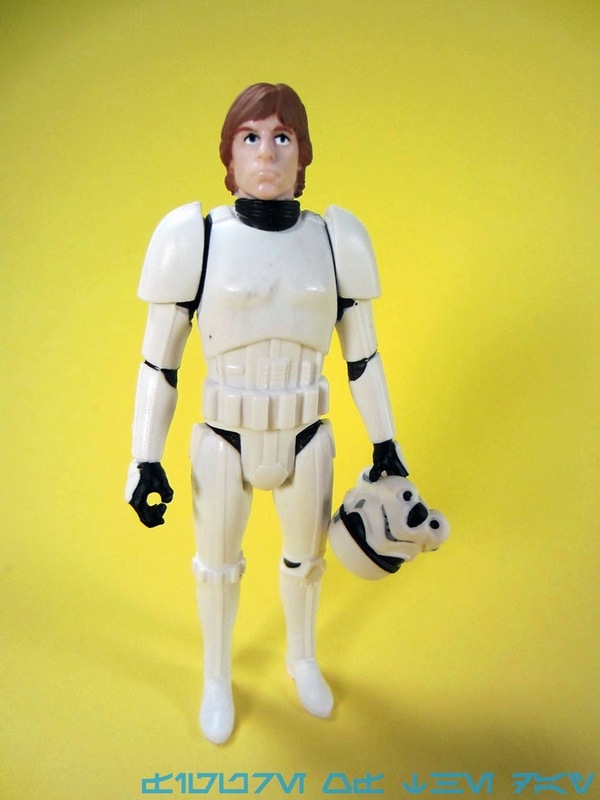 Luke Skywalker (Stormtrooper Disguise) comes up every few years and surprisingly, he often gets a new body sculpt for many of the releases. 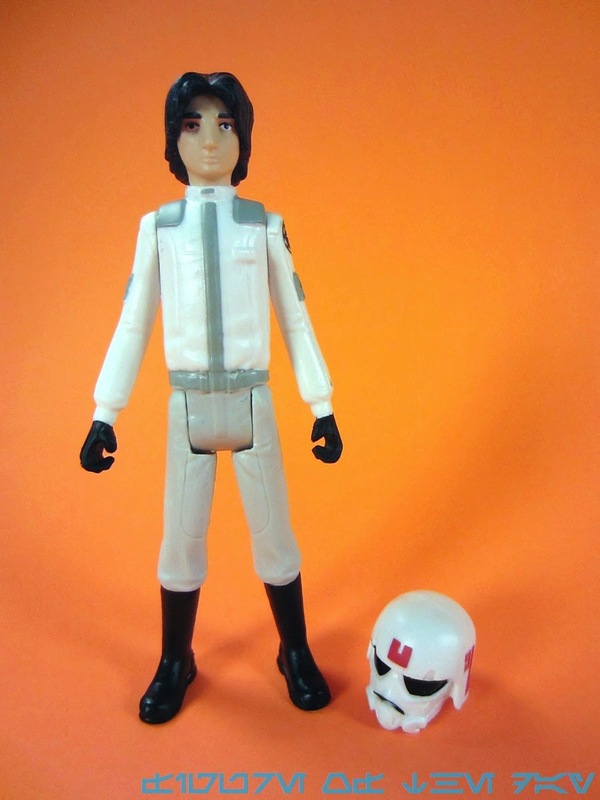 This one trades on the existing Stormtrooper's design, meaning Luke is not at all short this time around. He's the same size as the other troopers and his helmet is so snug, it might rub his nose down. It's a shame, as these figures tend to have better interaction with their accessories. For that reason, this figure doesn't make a great stand-in Stormtrooper, or a great Luke in disguise - it's sort of in a weird middle place. Technically it doesn't even have his own gun as it's given in-pack to Leia, but he has no problems holding it if you want to give it to him. 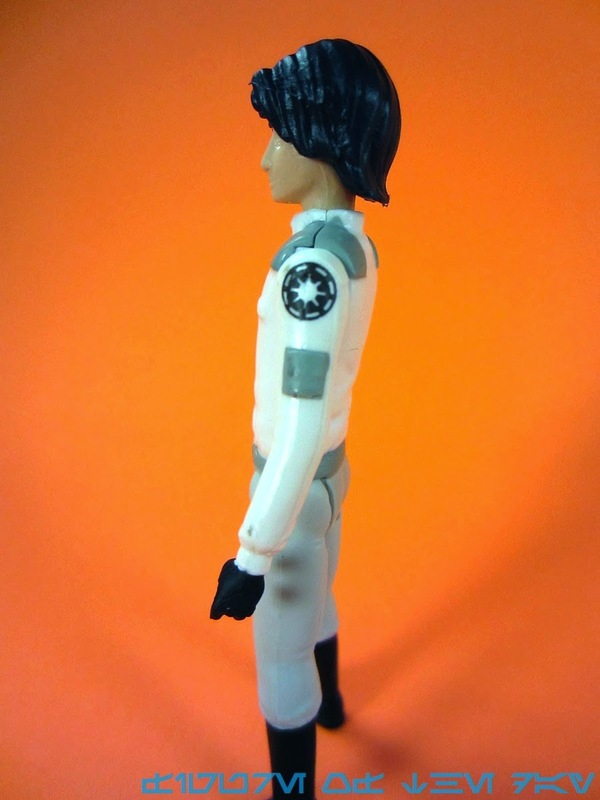 The head sculpt is on par with other recent Luke figures, with hair that's a little too brown for my liking. 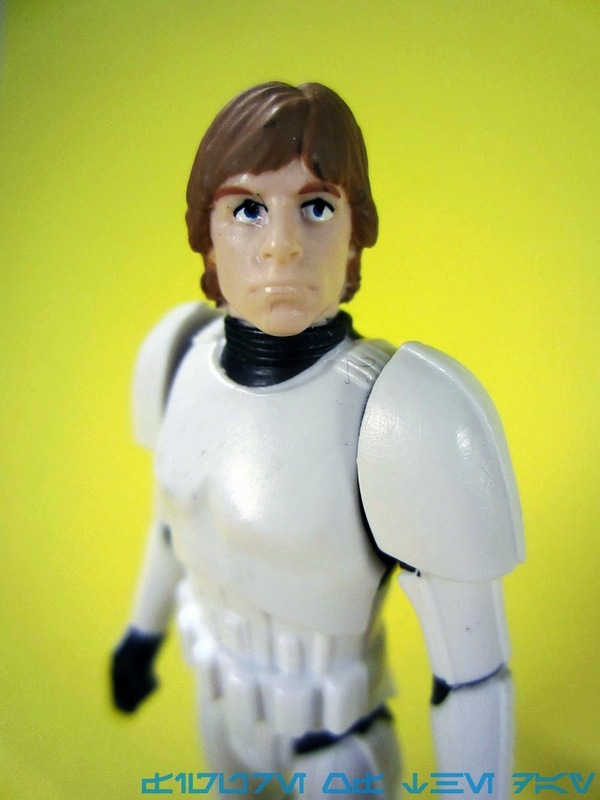 Luke also has the copyright information sculpted in his upper thigh, clearly visible when looking at the figure head-on or even in the package. This is kind of sloppy. His eyes look pretty good in person, but under the harsh lights of a digital camera's macro functionality things don't look quite as good. Even when I squint, in person, he looks OK. I blame technology. He could still use a gun, maybe better hair color, and a better-fitting helmet, but at least the eyes look OK here in the basement. Still, there's a novelty to getting yet another Stormtrooper and Luke in his disguise is a figure I'm always pleased to see, even if it isn't great. (It isn't great.) It's a fine sculpt overall, but the execution - specifically the too-tight helmet - places him at the bottom of the list for me. It's a good display piece, and if you leave his helmet off it's perfectly good, it's just that accessory interaction is far weaker than it should be in 2015. If it basically worked in 1984, in 1996, and every version since, it should really work here too - and an extra gun wouldn't have hurt them. Collector's Notes: I got this from Entertainment Earth. This set started appearing in stores late in March. 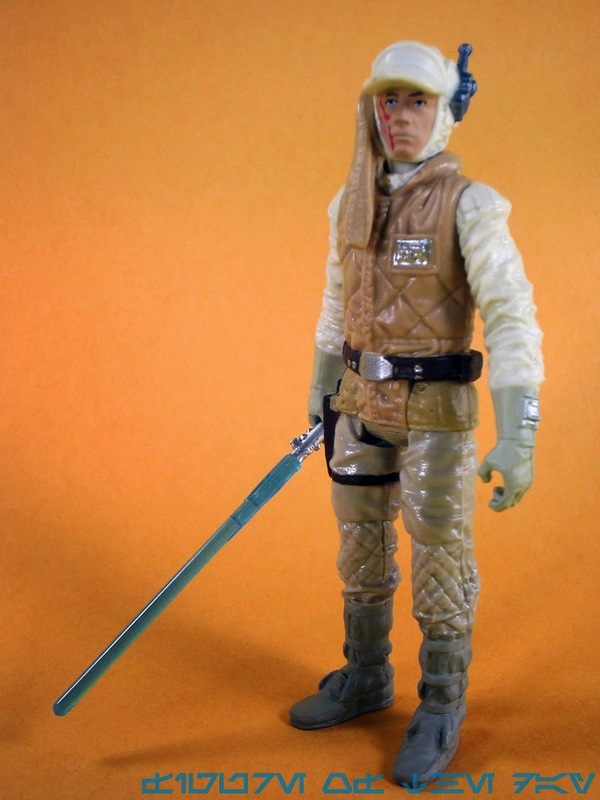 Interestingly, since they started making Luke in Mission Series and Saga Legends we've received updates of all of the 1970s and 1980s Lukes except the original farm Luke and, if you want to get technical, 1983 Jedi Knight Luke. 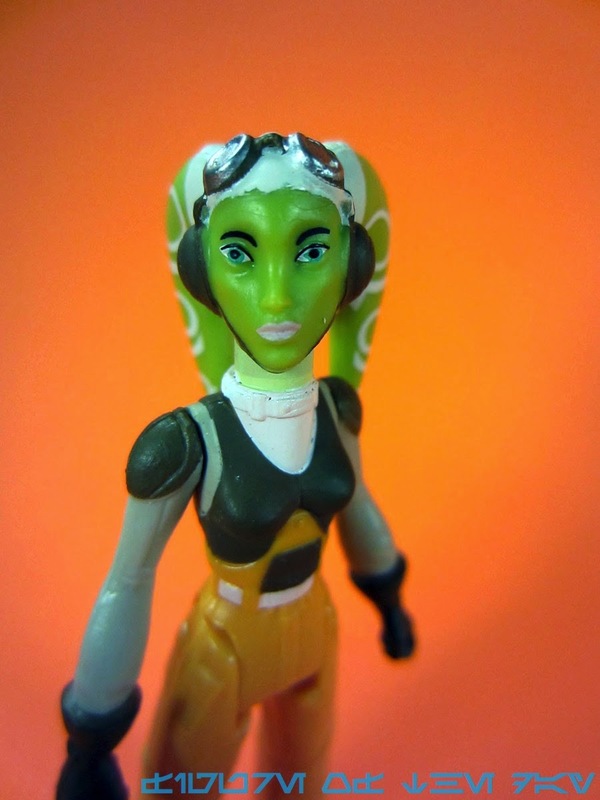 Commentary: It took three waves but we got Hera Syndulla action figures! Hasbro made an interesting editorial decision to include Stormtroopers - otherwise known as an easy sale - with their lady figures in the 2-packs, which makes me assume it was a form of insurance policy. If you won't buy the set for Hera, you're definitely going to buy it for a Stormtrooper Commander. As the show's most competent, least jerky character Hera didn't get enough screentime this year, and so far this seems to be her only other than a LEGO figure. This is a pretty neat figure, and best of all Hasbro made sure she can fit in the vehicle. They weren't too generous with paint, but there are some clever workarounds for that here. Many of the figures in this line have molded parts inserted in their limbs, rather than paint. 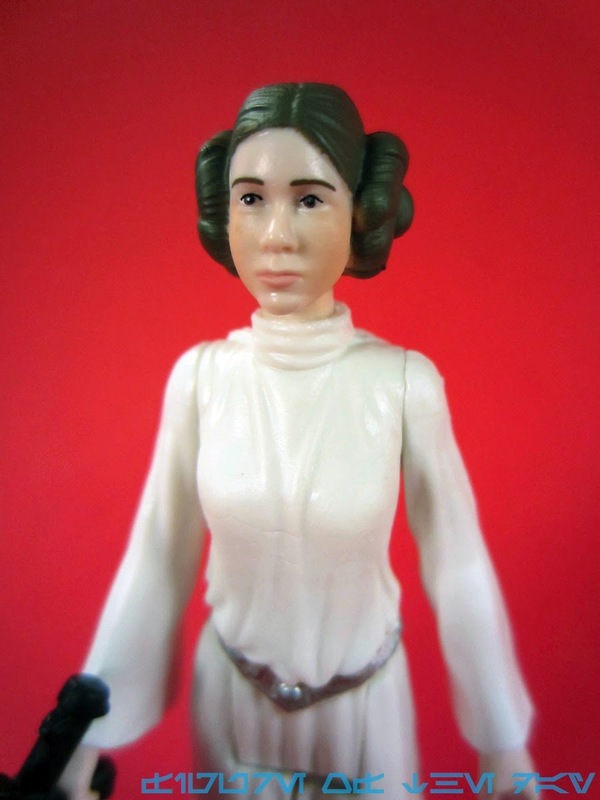 For example, the Leia we looked at has flesh plastic hands glued into white plastic arms with no paint. If the glue holds, this is great - that way paint won't wear off the hands. Hera's boots are brown plastic, inserted into unpainted orange plastic legs. Playmobil is king of this, using multiple colors of injected plastic instead of paint to save money and improve longevity. Her right boot has a holster molded into it, but it's too small for a gun and wasn't designed for interaction with a weapon. The gloves are painted, as are the belt, shoulder pads, and a few other bits and pieces. The hands have no real problem holding the weapons, and the paint works. The straps on the legs were left unpainted, unfortunately, but such is the future if trying to make toys cheap. Similarly, the paint on the lekku is a little on the whiter side so it doesn't quite look as natural as the animation model. The face is pretty good. We got lips, eyes, eyebrows, goggles, and the flight cap decorated with most of the attention to detail centered on this part of the toy. They didn't seem to cut any corners here, which is good, because this is where you really notice things going wrong. The head turns nicely and the figure's design doesn't hurt its ability to fit in the driver's seat of most of your vehicles. The head coloring contrasts a bit more than I'd like, but it works - you can tell who it is, and make out facial features without having to squint. Leia's coloring may have been too subtle for the size, or at least the lips don't quite "pop" at this size. If you're in the market for Hera, get this one. 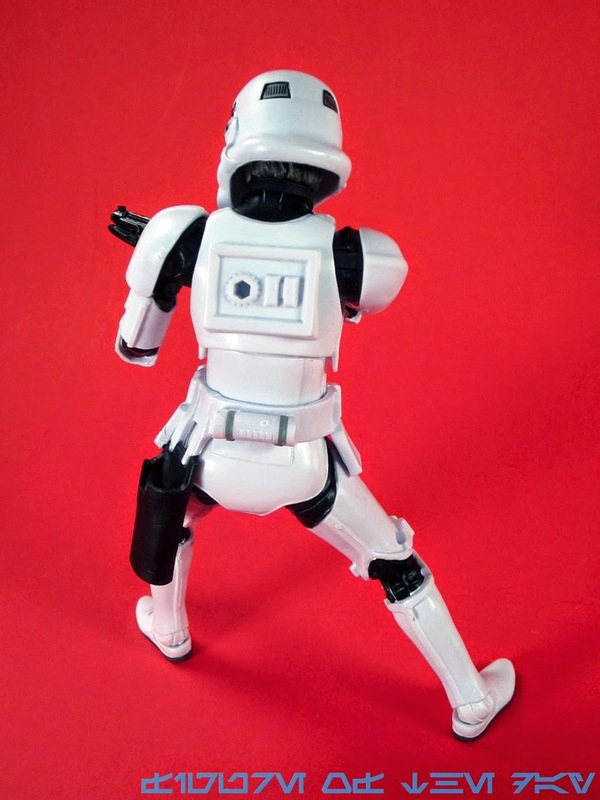 Don't wait for a perfect super-articulated one - there may not be another in this costume. And if there is, show Hasbro there's a market for more aliens by buying this one. If you're buying figures from the cartoons, this should probably be at the top of your list. 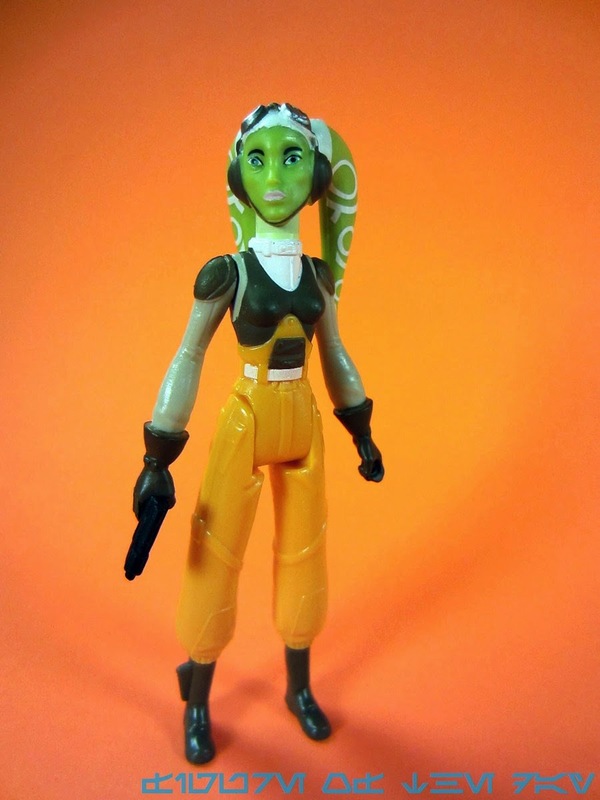 She's not the first green-skinned, orange flight suited Twi'lek with anti-Empire leanings but she's the first one to appear on TV and as such is a worthwhile purchase. 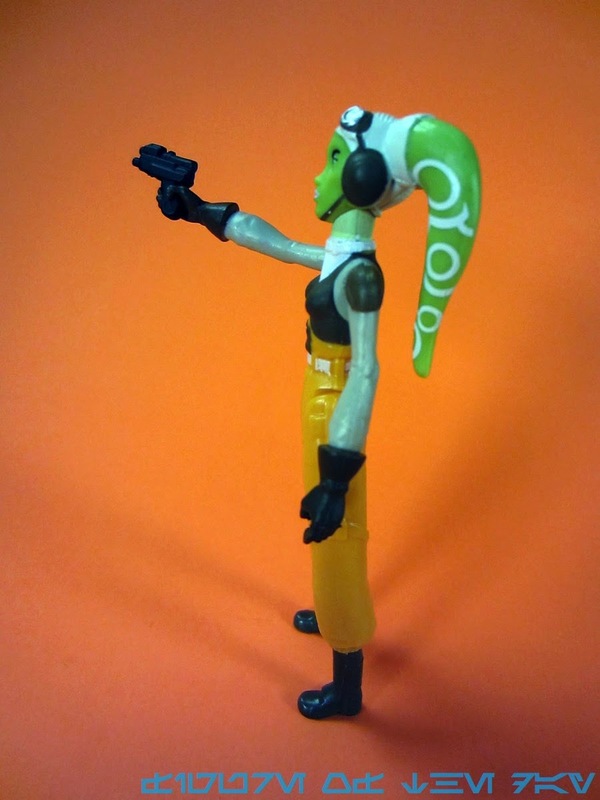 If you have Cesi Elrriss - and even if you don't - go try and get a Hera figure. 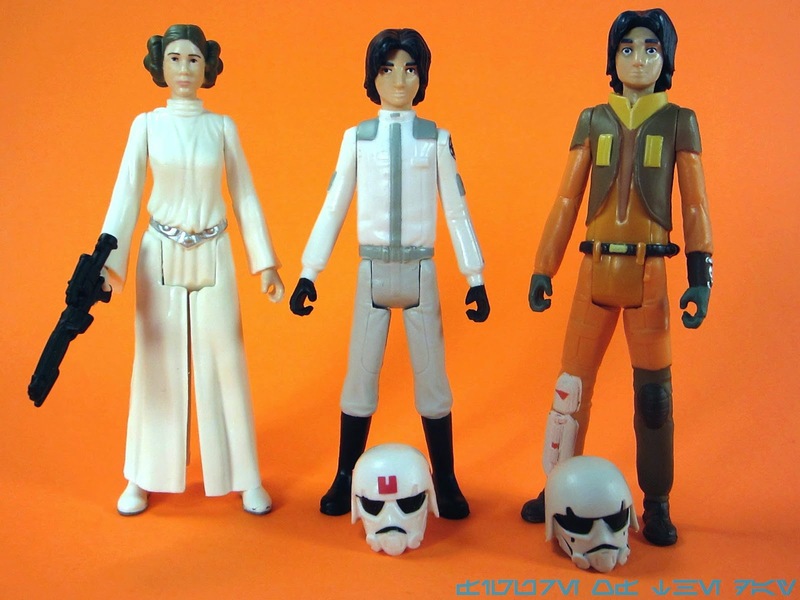 Commentary: It has been a few years since Hasbro gave us a new 3 3/4-inch white outfit Princess Leia action figure with her traditional hairstyle. The last individually carded ones may have been 2004 unless I'm blanking one out, although she appears in box sets every few years in one form or another. 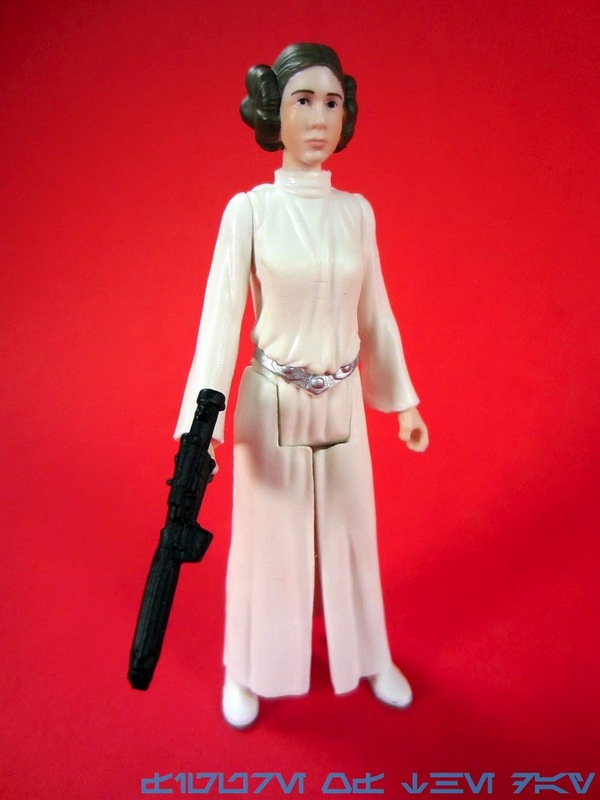 What's kind of amusing is that for the lead woman in the movie series, Leia doesn't get a lot of figures and a kid born 10 years ago probably never had a crack at a Leia in this outfit for under ten bucks. I know I keep coming back to this, but it does make a difference - if a kid can't get the figure they want, they'll get another toy. It might not be Star Wars, so hopefully this figure is in circulation for a while so kids might get a shot at her. This figure is an all-new sculpt which turned out acceptably. The sculpt is good, the deco is good, the execution is just OK. My main problem with this figure are how the legs are split, because there's a gap in the dress and there shouldn't be. Other figures with this sort of design have had the same problem lately, like Funko's ReAction Bride of Frankenstein from last year. She stands just fine, on shoes with painted soles! That's a big surprise - most of the figures don't have painted soles these days unless the entire shoe is painted. The face deco is pretty good, although the blush is turned up a bit and the lips are on the light side. A little more white in her eyes would help, but as it is she looks decent. It's a good Leia figure, but not a great Carrie Fisher figure. The sculpt and costume is pretty great - I like how they made her feel smaller for a change, and her pose is open to more options than "shoot to kill." She has no problems standing or sitting, and holds the gun perfectly. 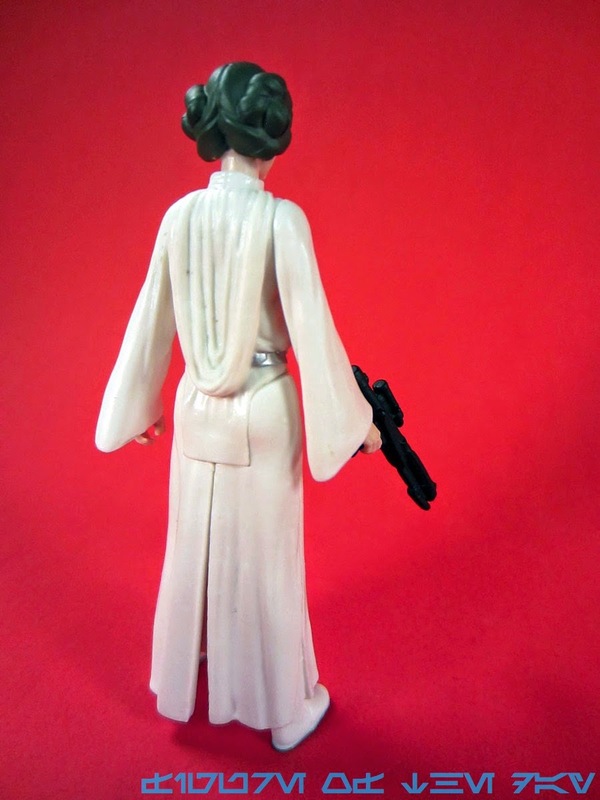 This is a great Leia figure for your 1990s Power of the Force playsets and the full-size modern Death Star that Hasbro will probably never make for us. Or the Tantive IV vehicle that, despite being the first vehicle ever seen in Star Wars, still has no 3 3/4-inch scale toy. But it's a good figure, and an OK set, so if you've got ten bucks I'd recommend it. Collector's Notes: I got this from Entertainment Earth. This set started appearing in stores late in March. This is only the second "5 POA" Leia since this form factor returned. 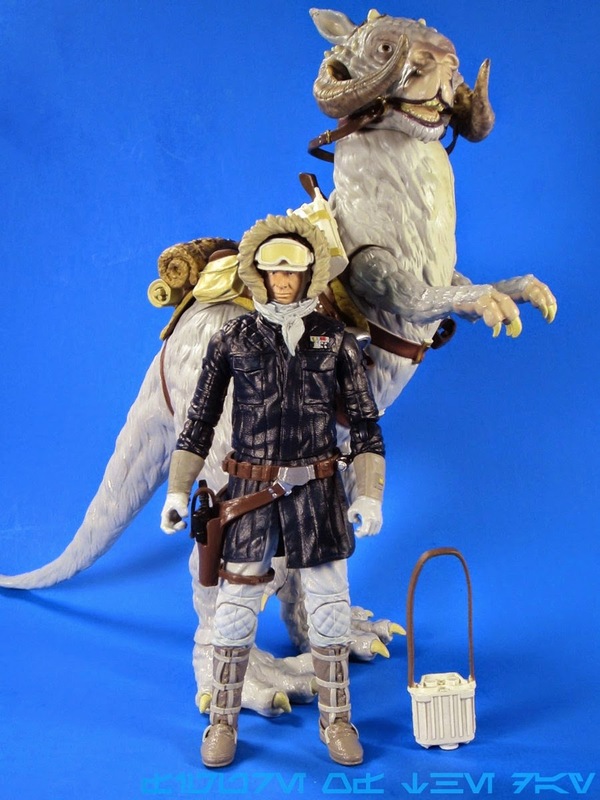 Commentary: There's no doubt that this Han Solo and Tauntaun 6-inch action figure set had some compromises in its design, but for the asking price it's pretty spectacular. Consider if you will that the last couple of Tauntauns were $25 a whack - one was a solo beast, the other included a couple of figures - and this upsized version is a pretty good deal. It doesn't have the same level of creature articulation, and there are a few areas where Hasbro could probably have spent a few nickels to make something spectacular, but compared to Jabba or the Speeder Bike at $40 this thing is killer. 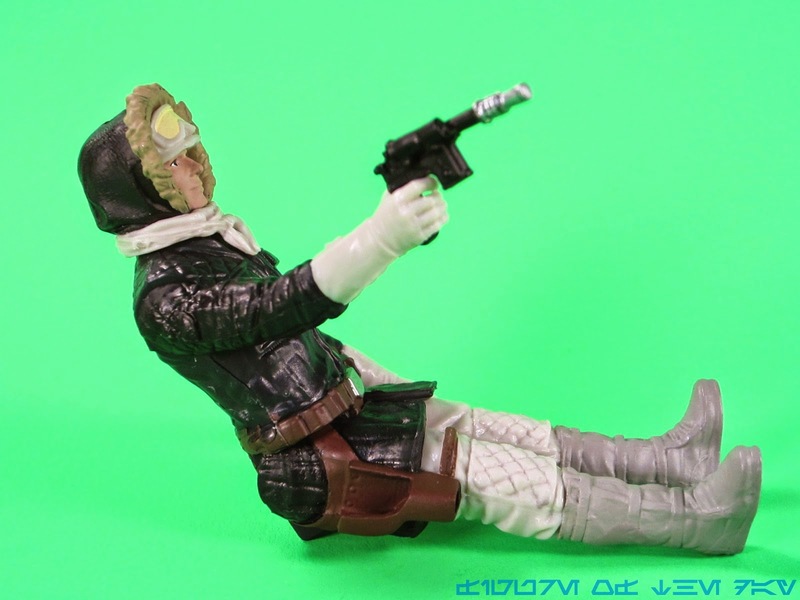 Han Solo has something like 23 points of articulation, depending on how you want to count. He has only one waist joint and his wrists only swivel and don't bend... but he comes with a Tauntaun. 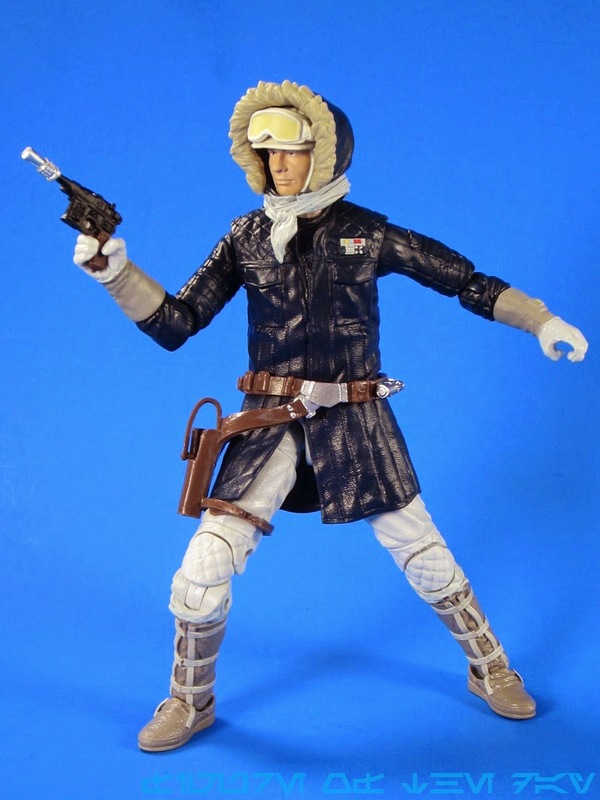 The Han Solo figure has a working holster, rocker ankles, and a removable hood with a thermal capped head underneath. His goggles are fully removable, but getting the goggles under the hood is a little tricky. The figure is a little light on painted detailing, making it look more like a big toy than a high-end collectible. I'm OK with this but it runs counter to the line's initial offerings. Han's head is more doll-like with simplified details and a good sculpt that's appropriately Han-esque. 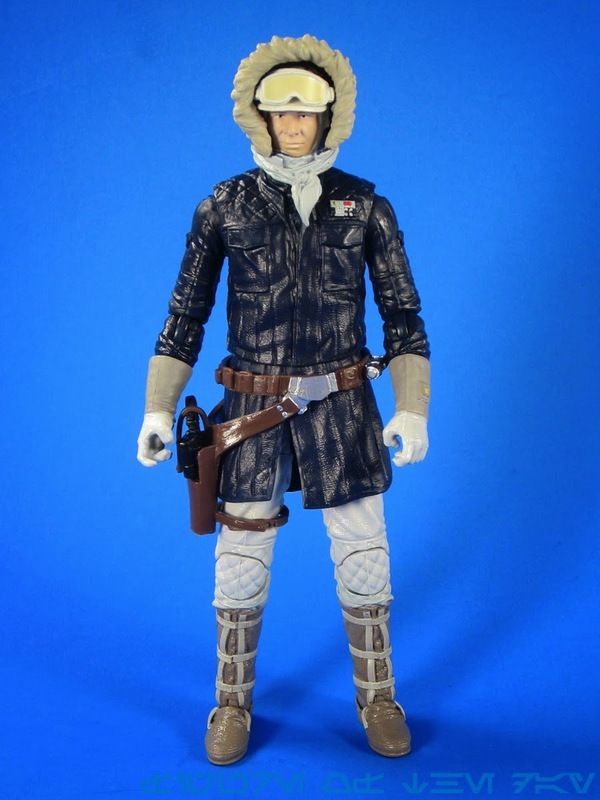 The figure is sturdy and stable, standing well or fitting on the Tauntaun about as well as any other Han over the past 19 years. Nothing will probably ever beat those trap door figures Kenner made 35 years ago, but such is life. I should also note his binoculars are a little too thick for his hands, and are basically there to look good or hang from his neck or shoulder. Had Hasbro left it out, odds are you wouldn't miss it much. I'd rather they have spent the money on making the googles clear at this scale, but again, what can you do? It still looks cool and is an impressive figure. I should also note Han's hood construction is pretty clever. The hood has a slice up the back so you can pull it off without tearing. Underneath is the thermal cap and you can place the goggles over the brim of his cap or on his eyes, but it really looks best on the brim. You can see more pictures below, because there are lots of pictures. 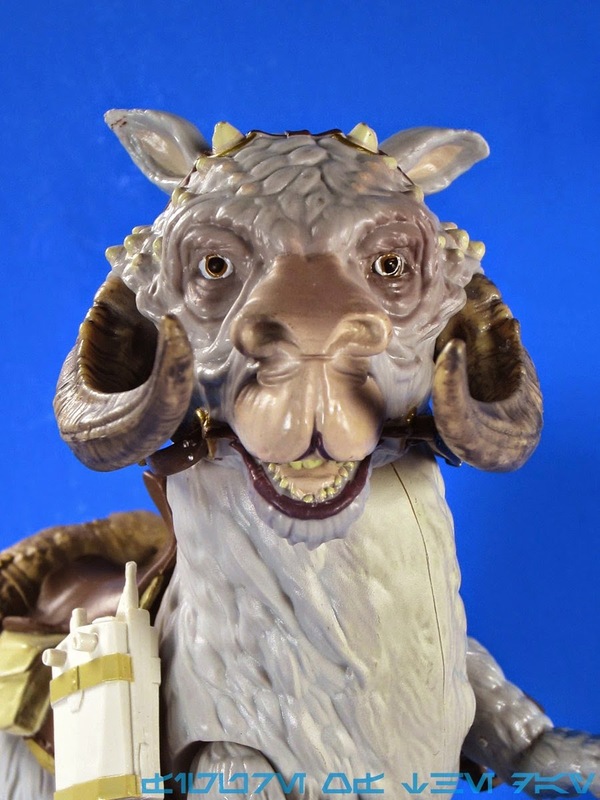 I was less impressed by the Tauntaun when I saw packaged shots showing up, but in person I'm immediately reminded of the crazy awesome (and utterly bonkers secondary market prices of) Target's exclusive 12-inch Tauntaun set in 1997. The figure is a little less wobbly, btu is otherwise about on par - you get swivel joints at the arms and hips. 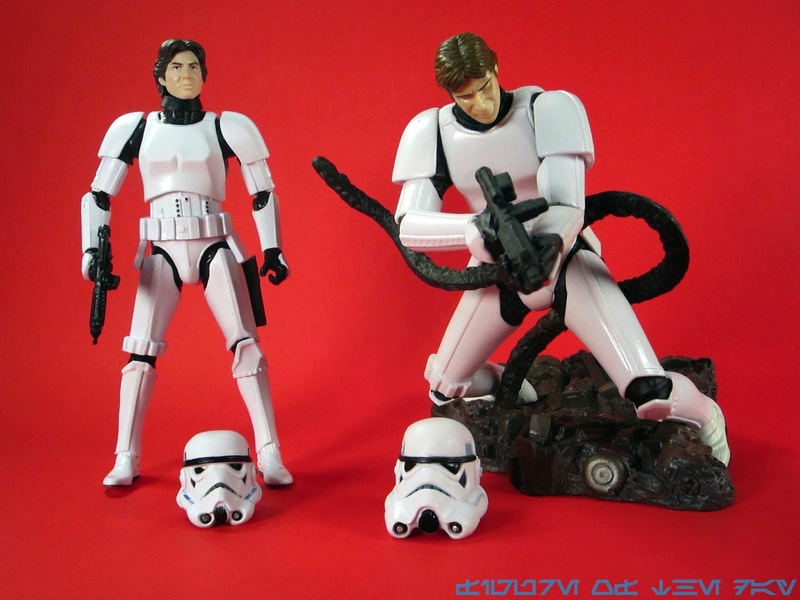 Each ankle has a ball joint to help balance the figure with or without a rider, and the stirrups in the removable saddle piece have a peg for the holes in Han's toes. Paintwork in the horn is remarkable, and the eyes and face are generally fantastic. The little horns and other elements all turned out great, as did his teeth and the interior of his mouth. A little exposed pink skin on his arms is a nice touch, but by and large the figure is an unpainted furry beast. 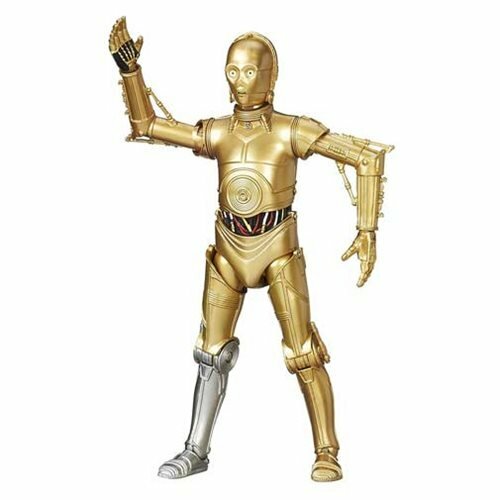 His arm is capable of moving around too, making this figure more interesting than Jabba - and that's if you ignore the included Han Solo figure. Hasbro did a magnificent job packing a lot of toy in a box for the price, and I'm super-excited to get the Wampa whenever that shows up. I have no doubt Hasbro could do a better job at a much higher price, but given the toy inflation these days this is a pretty spectacular set given the price tag. At $60, you'd probably have a good reason to gripe unless it featured a split belly or guts or some sort of action feature. This toy has none of those things. The good thing - or bad thing - is that this set sets a pretty good benchmark in competency. The blaster isn't too small and breakable like the Biker Scout. The set isn't an empty box of air like Jabba. And best of all, it's not a set lacking in history - this pairing is a fantastic recreation of one of the weirdest, greatest scenes in the entire saga. I hope Hasbro considers doing a few (very few) creatures and vehicles in this scale, like a Landspeeder or a Dewback. This set proves that they can deliver something pretty special without jacking up the price too high, and given every other toy manufacturer in 2015 that's nothing to sneeze at. Collector's Notes: I got this from Entertainment Earth. I have not yet heard of nor seen samples in the wild.